CAPTION: Bishop of Plymouth, Nick McKinnel, Archdeacon Douglas Dettmer and the churchwardens of Christ Church, Gilbert Tucker and Helen Chappell. Photo by Adrian Hough. THE next step has been taken in the life of Christ Church, Ellacombe, as the church building was handed over to become part of Ellacombe Church of England Academy School. 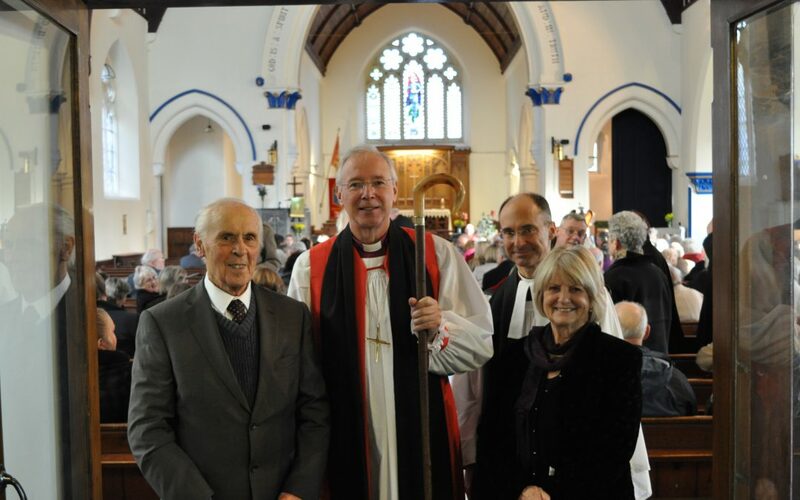 A special service was led by the Bishop of Plymouth, Bishop Nick McKinnel and the Archdeacon of Totnes, Douglas Dettmer to transfer the church building to the school, which has returned to its roots and become once again a Church school. The church building will continue to be used for worship by the school, but churchgoers on Sunday will worship in nearby churches. Hundreds of people came to the service to celebrate the life of the Church, which was built in 1868 and has been in use for weddings, baptisms, funerals and regular services ever since.